Say hello to our newest team member: Michail Batikas! 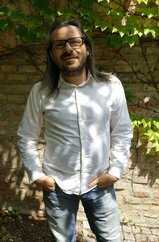 Michail Batikas has joined our ISTO research team as a postdoctoral fellow last month. He holds an MBA in E-Business from Athens University of Economics and Business and a Ph.D. in Management Information Systems from Universitat Pompeu Fabra. Michail’s research interests surround Technology Management and Technology Diffusion. Together with Jörg Claussen he is working on projects related to the digital economy. We are very pleased to welcome him on our team!